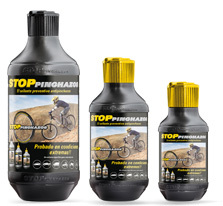 Installing STOP PINCHAZOS in the wheels of your bike, punctures will be repaired automatically and forever. Forget patches. Will not harm or affect the tire or the rim. Preventive and remedial fluid that automatically seals punctures up to 6.8 mm over 50 times throughout the tire life. Do not believe adherence with the tire. Will not dry and does not solidify. Compatible with other repair methods. Easy installation through the valve (Schrader type) or the tire bead breaker (type Presta). Remove the valve core remover and application tube supplied. Deflate the tire completely. Remove the valve core with the fan supplied or the tire bead breaking (Presta type).